5 p.m. until close, daily. The restaurant: from 6 p.m. to 11 p.m. 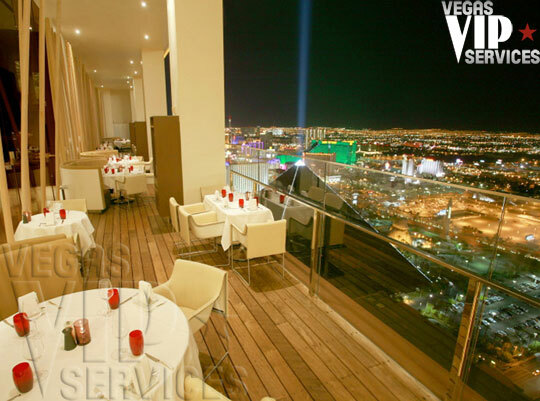 MIX boasts a great view of the Las Vegas strip, sitting 400 feet above the neon desert on top of THEhotel at Mandalay Bay. miX is an uber-lounge and a French/American restaurant, serving some of the best food in Las Vegas. The kitchen is open air, allowing guests to watch their meals being prepared. The ambiance is stunning. There is a 24-foot chandelier made from 15,000 hand-blown glass spheres. There is floor-to-ceiling faux brown leather, stunning open-air terrace views, and a wide range of inventive cocktails. Enjoy miX from the inside or step out to the 64th-floor balcony and get an adrenaline rushing view. Contact Vegas VIP Services to reserve your Bottle Service at Mix Las Vegas. The view was fabolous, we visited couple other clubs with view but Mix has by far the best Vegas strip view, drinks are expensive though, paid 16 dollars plus tip for a glass of vodka :(.